This article is about the dungeon. For the related note, see The Hoarvor Pit. The hoarvor, a colossal, blood-sucking tick, is one of the most repulsive creatures in all of Tamriel. 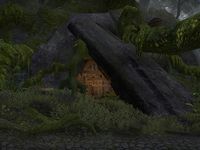 To anyone who knows the Bosmer, it will come as no surprise that many have a perverse admiration for the hoarvor, adopting the gross insect as a sort of mascot. 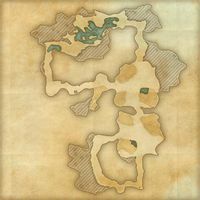 The Hoarvor Pit is a cave in central Malabal Tor, southwest of Vulkwasten containing hoarvors. An ogrim named Oghezai is bound deep within the cave, being fed on by the blood-sucking hoarvors that inhabit it. The hoarvors also feed on dead senche, crocodiles, and even Bosmer. A small valley is found in the northern part, infested with crocodiles.